at 1 Police Plaza if Bill de Blasio is elected mayor. 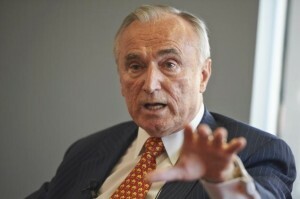 As a new poll showed him with an astounding 50-point lead, de Blasio on Thursday revealed that Bratton is on his list of potential candidates to be the city’s next top cop. “One person who’s been a very key adviser to me is Bill Bratton. I will certainly consider him,” de Blasio said in an interview on WCBS-AM.